I haven’t done more than play with the kit – which is called The Miracle of Maracuja, by the way - since it arrived after I’d already put on my makeup for the day, but I think that it’s safe to say this is a great kit. 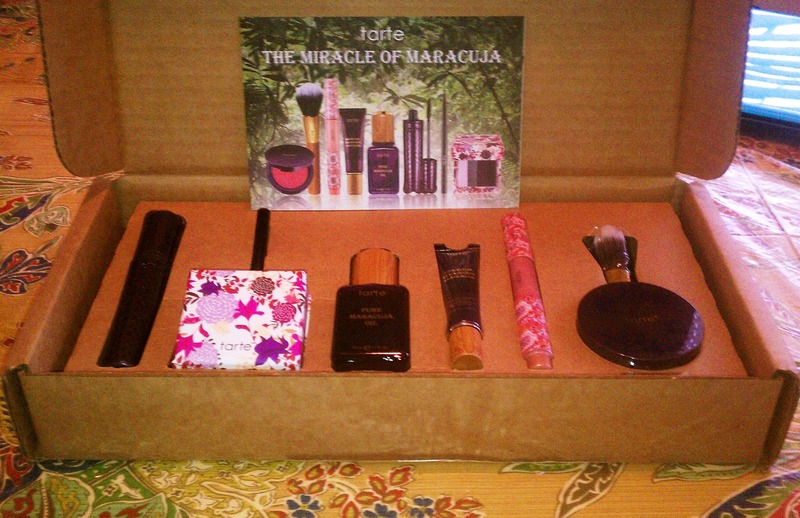 For $59.96 (+ $7.22 s/h), you get 8 full size products, several of which are new additions to the Tarte line. The TSV price will be good on Friday, March 16th, so you can tune into QVC or order directly from qvc.com that day. 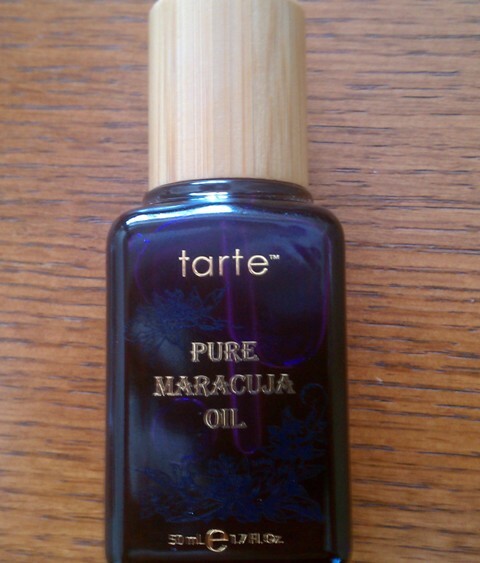 Pure Maracuja Oil – I would say this is the centerpiece of the kit given its name, though all the products contain maracuja oil. The bottle that is is 1.7 fl. Oz., which is full size and retails for $46 by itself. I’ve gotten the oil in previous kits and actually alternate between using this and Josie Maran’s Argan Oil to moisturize my face. It absorbs into the skin pretty quickly and works really well. I like it a lot. Maracuja Creaseless Concealer in Fair – I am a big fan of this concealer, and you can read about it in my post on the third shipment of the Tarte Glow your Way to Gorgeous TSV. 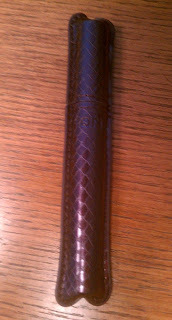 The tube in this kit is smaller than the ones I received in the previous TSV – 8 grams to 12 grams – but I actually don’t mind. 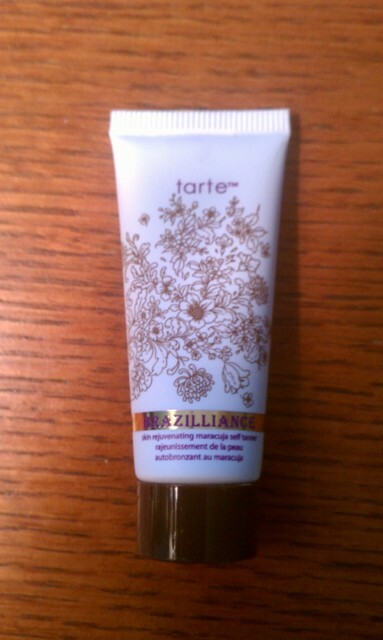 A little of this stuff goes such a long way that I’ve barely gone through a quarter of one tube yet. Actually, since I signed up for auto-delivery for this TSV too, I’m going to be swimming in the stuff. I may have to do a giveaway so they don’t go to waste. 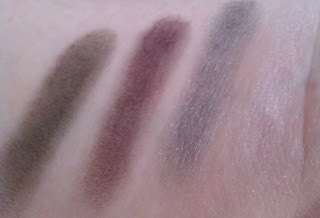 Evoke the Smoke Swatches - left to right: Dark Ash, Purple Fog, Silver Mist, Pink Cloud. 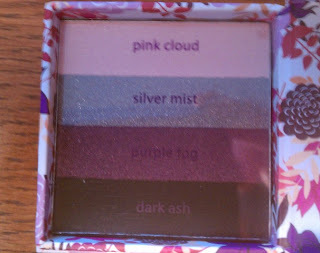 Beauty & the Box Amazonian Clay Eyeshadow Quad in Envoke the Smoke – First of all, on a totally shallow note, I adore the packaging of this shadow palette. It’s in a cute little cardboard box kind of like Benefit’s boxed powders and has pretty pink, purple, lilac and peach flowers all over it. The eyeshadows are quite nice too – I’m really happy that the colors are cool because the last TSV from Tarte with shadow palettes all seemed to have warm tones. I’m not sure how well you can tell from the pictures (I apologize for the poor quality … it was a gray, dreary day so no natural light) but besides the pale pink shade, Pink Cloud, they’re all pretty pigmented. In particular, the silver shade, Silver Mist, is gorgeous. My other favorite is the purple, Purple Fog. 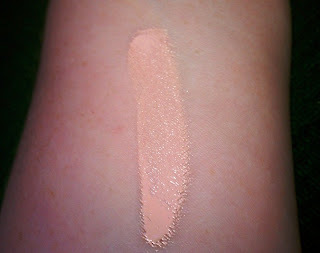 While Pink Cloud isn’t that pigmented, it does have a pretty, brightening effect on the eye. 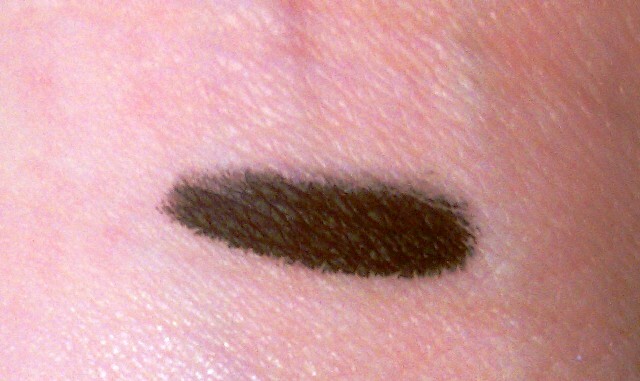 Dark Ash is your basic black, but it works well for setting the eyeliner. Cashmere Waterproof Gliding Liner in Black Magic - This is a nice, creamy black liner and it’s waterproof so it works well on the waterline. Comparing it to Tarte’s other waterproof liners, the Amazonian Clay Waterproof Liners, I’d say the Cashmere Gliding Liner goes on a little bit more smoothly. It sets quickly too. Lights, Camera, Lashes! Mascara – I mentioned this mascara in the Glow Your Way to Gorgeous post, so I won’t say too much … other than that I love it. It does a really good job adding volume to my lashes, but it lengthens them a bit as well. Like the concealer, I have enough tubes of this to last a lifetime. Definitely another item for the giveaway pile. 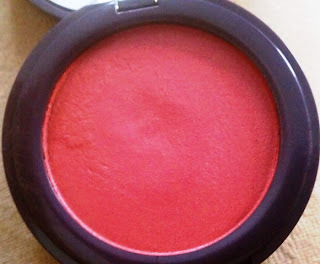 Airblush Marajuca Bouncy Blush in Amused/Shimmering Poppy – This was the item I was most excited to try. I am a big fan of cream blushes and since Tarte did such a great job with their Amazonian Clay 12-Hour Blushes, I figured this Maracuja Blush had serious potential. Now, I haven’t tried Maybelline’s Dream Bouncy Blushes but I’ve looked at them in stores and watched quite a few YouTube reviews, and besides both having the word ‘Bouncy’ in their names, I don’t think the Tarte version bares much resemblance to the Maybelline item. 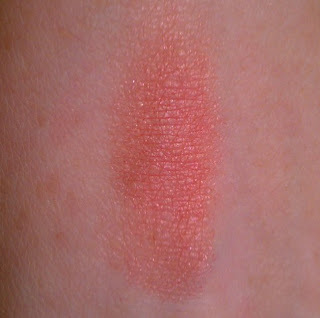 It feels slightly spongy when you touch it but for the most part, it acts like a regular cream blush. 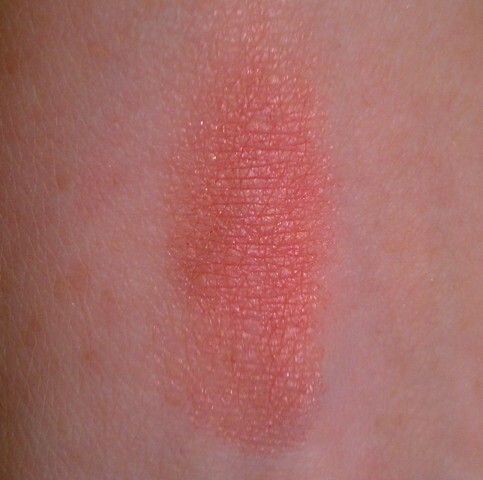 The color is a pretty coral with subtle shimmer, and it blends nicely on the skin. 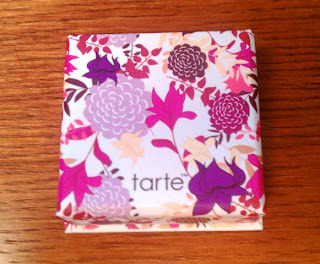 I’m not sure what the shade’s name is – the back of the compact (which wins points for adorable packaging too!) says Shimmering Poppy but the little pamphlet that comes with the kit refers to it as Amused. Your guess is as good as mine. I also want to add that I don’t think the blush and eye shadow quad really go together since the shadows are cool toned and the blush leans toward the warmer end of the spectrum. I still love both, though. 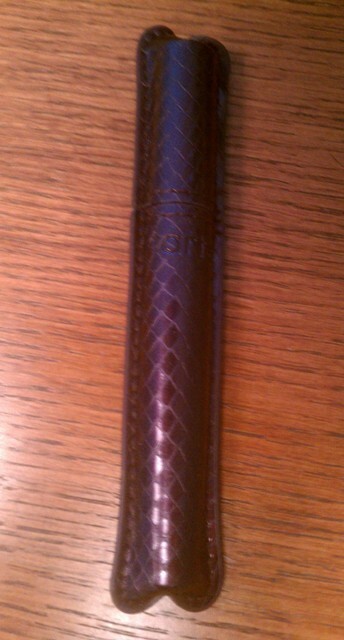 Maracuja Divine Shine Lip Gloss in Peaceful – This is one of those click-y lip gloss with a brush tip applicator. While there’s obviously maracuja oil in it, it’s a lot like Tarte’s PureOptic Lipglosses - same minty taste and sheer color. However, the Maracuja gloss may actually be a little less sticky. 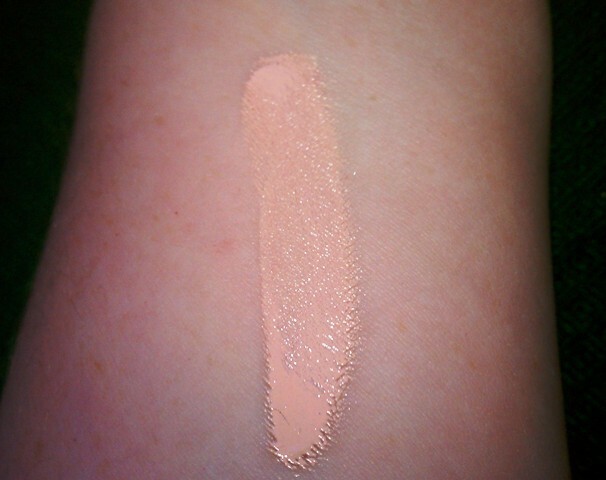 It’s a pretty golden pink with subtle gold shimmer, but as I mentioned, it’s pretty sheer. I think it works best layered over a lipstick or lip liner. 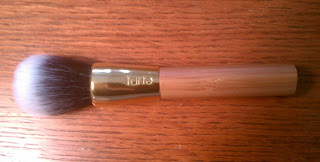 Airbrush Finish Bamboo Blush Brush – This is a nice synthetic brush that’s fairly stiff and not too dense, so I think it’ll work well with the cream blush. I haven’t washed it yet, but I’ll give it a go this weekend. 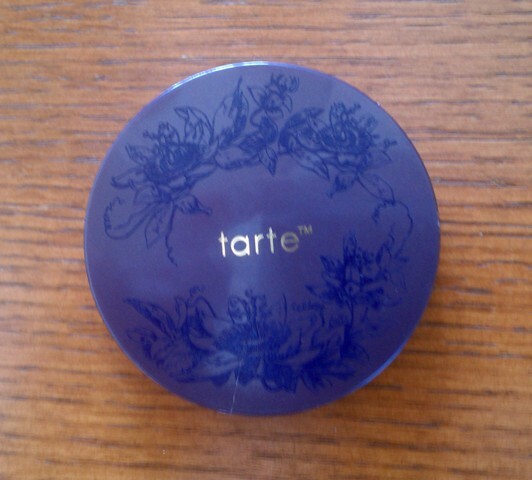 Now, as if that wasn’t all good enough, when I was getting ready to throw the box away, I realized that Tarte was kind enough to include two little extras beneath the cardboard insert holding the products in place. There was a small sample of the Smooth Operator Amazonian Clay Eye Base and Brazilliance Skin Rejuvenating Maracuja Self Tanner. The box for the tanner says ‘Sneak Peek’, so I guess this is a product coming out in the future. I’m excited to try the eye base, but the tanner’s going to the giveaway pile too since I don’t use self-tanner. What do you think of the kit? Are you planning on buying it? Are there any folks as impatient as me out there who already ordered the kit? What do you think? thank you for your review.As for the blush is it kind of like a sponge with pigment absorbed into it or is it an actual cream blush where if you tried to scrape off a chunk it would come off? It's not exactly like a traditional cream blush - if you press your finger into it, it makes a dent in the product because it is slightly spongy. 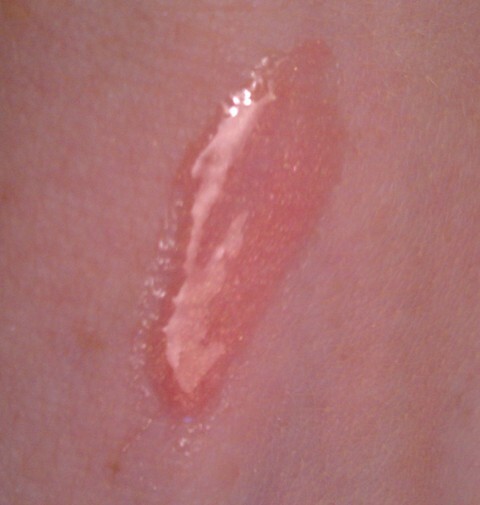 But I think if I scraped it, a chunk would come off. The biggest difference between the Tarte blush and a regular cream blush is that the Tarte isn't as greasy. It has a drier feel and lighter consistency, so I think it would work really well on oily skin (though it works just fine on my drier skin too). do you think it would layer nicely on top of mineral foundation or would it disturb the foundation? I have not used cream blush in a while and use to powder blushes. 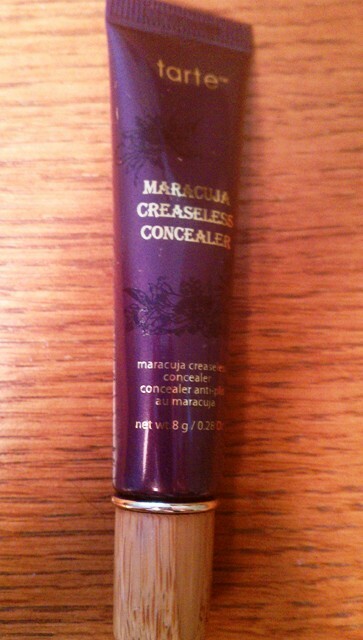 I've tried it over my Bare Minerals and Laura Mercier mineral foundations, and it didn't disturb either at all. I applied it with fingers and with the brush from the kit, and both worked well. I think the blush's drier texture makes it more compatible with powders and powder foundations than a traditional cream blush. Well thank you for your response and your reviews. I will definitely follow your blogs from now on.